Avoid essential oils that have been diluted with vegetable oil. To test this, place a couple of drops on a piece of paper. If the drop leaves an oily ring, it likely contains vegetable oil. Choose oils from companies that list the Latin name and common name on the label as well as the country of origin. Essential oils should be sold in dark amber or blue glass bottles. Clear glass allows unfiltered light to enter and can cause the oil to spoil. Never buy essential oils in plastic bottles as the oils can leach plastic and contaminate the product. 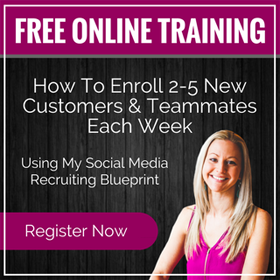 Make sure the company does 3rd party testing. 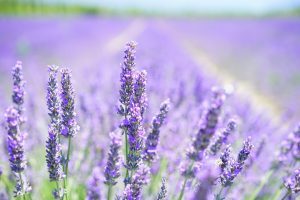 Essential oil companies who voluntarily have their products tested for quality and manufacturing standards feel confident about the quality of their products. 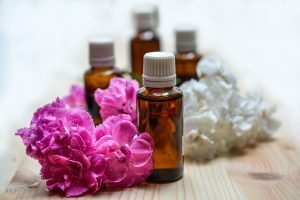 It’s unlikely you will find adulterated essential oils or poor quality essential oils from companies who voluntarily undergo third party testing for their products. Look for an education portion on their website! A good essential oil company will have an educational proponent to their website. Most people need to read and do some research on their own. I’ve found that websites that share information that can be corroborated by other sources, are more trustworthy. Now that you know what to look for when purchasing your essential oils, lets have some fun on how they are beneficial as well as how to use them for skincare! Lavender oil is the one oil that I suggest no one goes without! The smell alone is enough to have it on hand as well as the way it helps you relax and your body adapt to stress but it also has great benefits for your skin! It helps regenerate skin cells, which is amazing for mature skin, sun spots, and scarring. It is a great oil for all skin types! • Diffuse for mental clarity, peaceful sleep and relaxation. • Apply directly to the temple to relieve headaches. • Add 1-2 drops to coconut oil for chapped skin and lips. • Add directly to the skin for bug bite relief. • Add a few drops to a carrier oil for sunburn relief. Tea Tree Oil is one of the more well-known essential oils for acne-prone skin. It has antibacterial properties that help ward off acne-causing bacteria and assist in healing wounds. It also helps to regulate oil production, which can decrease the severity and incidence of breakouts. • Add to organic facial cream or toner to help fight acne. • Add to toenails to combat fungus. • Add to a carrier oil and apply to Athlete’s feet. Patchouli Oil is particularly great for aging skin. It promotes new cell growth and smooths the appearance of fine lines and wrinkles. It also has antiseptic, anti fungal, and antibacterial properties so it can also benefit skin conditions such as eczema, dermatitis, psoriasis, and acne. • Add 3-5 drops into a carrier oil for a therapeutic massage. • Add 10 drops into your bath water. • Add 4 drops to water or witch hazel for a natural bug spray. • Add 5 drops to 1 TBSP of carrier oil or unscented organic moisturizer for facial cream. • Add 4 drops to 2 oz of water in a spray bottle for a chemical free deodorant. • Add 3-5 drops to a diffuser filled with water for a peaceful transition to sleep! Ylang Ylang Essential Oil helps to control oil production and minimize breakouts. It also helps regenerate skin cells, smoothing fine lines and improving skin elasticity. Another great essential oil for every skin type. • Add 5 drops to chamomile tea for use as a calming facial toner. • Add 3-4 drops to coconut oil in a roller-ball and rub on the abdomen to balance hormones. • Massage a single drop into a sore muscle area to relieve tension. • Add to a diffuser for stress relief. Rose Essential Oil is especially great for dry or aging skin. Researchers have found that it contains several therapeutic compounds known to promote healing, especially antimicrobial and anti-inflammatory compounds. 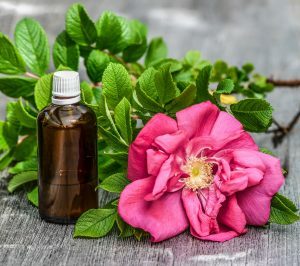 As a result, rose essential oil helps refine skin texture and tone, and can be helpful with managing skin conditions such as psoriasis and dermatitis. Very calming and also boasts an amazing scent! • Add 1-2 drops to the abdomen to relieve menstrual cramps. • Add 1-2 drops to wounds and insect bites to prevent infections. • Add 3-4 drops to water or witch hazel in a spray bottle for a calming and balancing facial toner. • Add 1-2 drops to stretch marks and scars to reduce appearance. Neroli Essential Oil is great for oily, sensitive, and mature skin. It helps to smooth fine lines and tone sagging skin. This rejuvenating oil contains a natural chemical called citral, which helps regenerate cells. It is said to be very good at preventing and healing stretch marks, as well. Its antiseptic properties also balance oil production and shrink the appearance of pores without drying skin. • Add to diffuser to lower blood pressure. • Add a few drops to bath water to relieve PMS symptoms. • Add 3-4 drops to lotion or oil to reduce stretch marks. • Add 1-2 drops to a damp cotton ball and dab on areas to treat acne. • Add 3 drops to facial cream to regenerate skin. Myrrh Essential Oil has amazing anti aging benefits! It has strong anti-inflammatory properties that help improve skin tone, firmness, and skin elasticity, reducing the appearance of fine lines and wrinkles. Myrrh oil can also help heal sun damage, chapped skin, rashes, and eczema. • Add a few drops to water and use as a mouth rinse to protect gums and freshen breath. • Add 2-4 drops to a cool, wet towel to create a homemade compress for skin sores and wounds. • Add 3-4 drops to a diffuser to help relieve stress and combat upper respiratory infections. Geranium Essential Oil helps regulate oil production and reduces acne breakouts. It helps improve skin elasticity and tighten skin, reducing the appearance of wrinkles. It promotes blood circulation to the areas where it is applied, helping to heal bruises, broken capillaries, burns, cuts, dermatitis, eczema, ringworm, and other skin conditions. This is an amazing essential oil to have on hand! • Add 2 drops to face lotion and use 2 times daily to help diminish wrinkles. • Add 5 drops to a spray bottle with 5 tablespoons of water for a chemical free deodorant. • Add 1-2 drops to cuts or wounds and cover with gauze to help with healing. Frankincense Essential Oil has antibacterial and anti-inflammatory benefits, which is great for acne-prone skin. It is also a natural toner, decreasing the appearance of pores and evening skin-tone. It encourages new cell growth, helping to tighten skin and reduce wrinkles and the appearance of scars. It also helps soothe chapped, dry skin. It is perfect for all skin types! • Add to itchy skin for instant relief. • Apply 1-2 drops to brittle nails to help strengthen them. • Add 1-2 drops to a carrier oil and apply to soles of feet to strengthen your immune system. • Add 3-4 drops to a carrier oil and rub on abdomen to relieve gas and bloating. • Apply directly to a wart for 1-2 weeks. Carrot Seed Essential Oil has a rejuvenating effect on the skin. It not only works to help smooth skin, but assists with cell regeneration. It can aid in reducing scars and improve the tone of aging skin. It is also rich in antioxidants, helping to neutralize inflammation and wrinkle causing free radicals. • Add 3-5 drops to 1 Tsp of a carrier oil and apply to skin in a circular motion to help prevent dryness and discoloration. • Apply 10-12 drops directly to the scalp and massage for 5 minutes before going to bed to reduce dandruff. Wash out the next morning. • Add 1-2 drops to your pillow to promote restful sleep. • Add to a diffuser for an amazing smell! « Previous Post Balancing Body Posture with Everyday Practices Next Post » Herbs that Boost Immunity Naturally for every household! 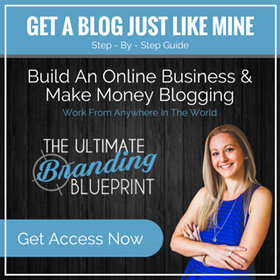 1 Response to "Essential Oils – Choosing Quality Brands"